This Speedy Cheesy Pasta Toss is on the table in minutes - use the microwave to cut down on prep time and toss in your favourite veggies to make it your own. COMBINE 1/2 cup each CHEEZ WHIZ Spread, MIRACLE WHIP Dressing and milk. Microwave on HIGH for 30 seconds and whisk until texture is smooth. Beat in 4 eggs. BOIL 2 cups of spaghetti in salted water until tender; drain and return to pot. TOSS in egg mixture and return to heat to warm veggies. 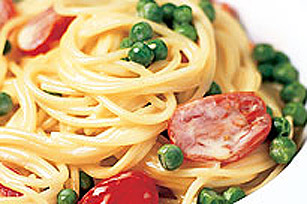 Kraft Kitchens veggie picks: tomatoes and peas.